I’ve been planning to build nice tube preamp for a while and on summer break I got a chance to do it. My first choice was to take AX84.com High-Octane amp, build preamp only but with the cathode follower converted to the gain stage and with source follower after that. The sound was pretty disappointing. It sounded allot worse than my Firefly with cascode boost on. Also there was squeal with gain set on more than 3/4 even I used shielded wire for all signal leads. So I decided to rebuild it without true bypass switch that was originally there and I started with Matchless Hotbox schematic. This time I didn’t use shielded wire that much, but I took care about layout more. Bright cap on clean channel pot is 220pF instead of 180pF, that’s the nearest value I had. Also, I made different power supply with two 47uF and one 22uF filter caps. I have higher voltage to start with, so resistor in first filter stage is increased giving even better filtering. Instead of 6.3V AC powered heaters I used regulated and heavily filtered 6V DC. To avoid any interference I separated power supply with actual circuit. Power supply is packed inside old computer PS unit I had lying around. Four thick speaker wires and SpeakOn connector are used to transfer power to stompbox. One is for ground, one for 6V heaters and two carrying B+1 and B+2. All these changes should provide nice flat current for noise-free tone. As always, I was trying to get the best parts possible. Coupling caps are Mallory 150’s and Mylar poly caps are used for cathode bypass and Silver Mica for all other caps in pF range. All resistors except in power supply are metal film. Some of them are 2W, some 0.6W and one is 0.25W (I didn’t have anything else at the moment 🙁 ). For wiring I was using combination of great #22 gauge solid core wire (a gift from AmpMaker.com) and shielded wire for some leads. Originally I used two new JJ/Tesla 12AX7 tubes. I tested all combinations with NOS GE 12AT7, EI 12AX7 and JJ/Tesla 12AX7 and I noticed that 12AT7 as cathode follower gives about twice volume compared to 12AX7. I used 12AT at second position for a few months but I finally settled with JJ/Tesla at first position and EI at second (I heard that JJ’s don’t last long when used as cathode followers). Previous version had 470pF cap going from last stage anode to ground to smooth tone a bit. I put it because dring first test sound was to fuzzy and bright. After playing with it for a few months I realised that preamp was not the reason for fuzzy sound and 470pF cap only reduced distortion and made sound little dull. The last version does not have smoothing cap. Center stomp switch is for channel selection and the one on the left for switching bass response of the first triode. That way it affects both clean and dirty channels. For both of them there’s LED indicator between tubes. You’ll notice two different knobs on the right of enclosure. I put the different one because it’s clean channel volume control. All the others are related with dirty channel so I was thinking it wouldn’t be a bad idea to be different. Besides, I didn’t have six knobs of the same kind 🙁 . Here’s first tube wiring. I put grid resistors directly to tube socket to reduce noise and save board space. Input jack is very close so there was no need for shielded wire going to grid. I used shielded wire for second grid because it’s rather long lead going from Gain pot. In my first version all other leads were shielded which cause real mess inside and more noise, oscillations and whatnot. By the way, tube sockets are mounted on aluminum holder which is screwed to the enclosure (yeah it’s aluminum, just it’s anodized to look like brass) and circuit board is glued down to it with epoxy. Second tube is wired without shielded wire. There was no need for it because one grid lead is short enough and the other is wired directly at the socket because second triode is a cathode follower. Also note two resistor in parallel in tone stack. First version used stock 100K resistor but when I switched to Marshall style tone stack I put 47K in parallel which gives about 32K – close enough to 33K. This photo is taken before I removed that ceramic snubber cap from pin 1 to pin 2 and put 470pF cap from third stage to ground. It’s mounted directly on tube, from pin 2 to pin 9. This photo shows pot and switch wiring. On the left side there’s bass response switch which toggles two 0.22uF caps in parallel with stock 0.22uF cathode bypass cap. It was very tricky to do the rest of pot/switch wiring because space is really tight. I used shielded wire on leads which could interfere with near leads. Clean channel is done without shielded wire. Those two leads are near some dirty channel leads but when clean is engaged there’s no signal in “dirty” leads so my clean is very noise-free. Dirty channel is also very quiet, noise wise. And finally the result: clean channel is great. I’m glad I put switchable cap(s) on first triode because both settings sound nice. 0.22uF is tight and bright, while 0.68uF is slightly warmer and fuller. Dirty channel is now tweaked the way I like. Smooth, warm, without excess distortion – great for rock. With TS808 in the front it can do heavier stuff as well, such as Satriani, Vai and even Dream Theater. Pozdrav Bane, uzeo sam da pravim ovaj preamp i zaglavio sam oko napajanja. trebaju u napajanju kako bih doveo napone do potrebnih? Cao. 4 triode vuku manje vise 4mA, tako da svaki K otpora ce ti spustiti napon za po 4V. Ja ne bih spustao nesto previse napon, dobro radi to i sa 320V i sa 400V. Stavio bih mozda 4.7K 2W da sidje na oko 300 i to je to. Taj otpornik ce pomoci i za filterisanje DC-ja. Ujedno da pitam,kog napona mi trebaju kondezatori(katoda,tone stack,spoj anode jedne triode s gridom druge itd.)? gledaj da uzmes min 20% vece nego sto ocekujes da bude napon na tom mestu. Za visokonaponske filter 400V ili 450V (eventualno 350), za signal kondenzatore koji idu na anode ili 400 ili 630V, za katode 25V, 35V ili koje god. Hey! Just found this and getting ready to order parts. Is there any other type of preamp youd recommend building into a pedal to get some good high gain stuff? Hotbox preamp with a decent overdrive at the front can cover a lot of ground as you effectively have 4 channels to play with. I used that combination for rock and metal. If you want higher gain preamp that can do metal on its own, my IIc+ and SLO preamp builds are good starting points. Although they are bigger than pedal form and more complicated. Starting with hotbox is a good idea. It sounds great and is very versatile. Good building block. Hey thanks for response Bancika! I have been filling up my shopping cart with parts from tubedepot and was curious about some of the parts you used. Let me know how I can possibly share with you what im ordering and whether or not it will work for the build. Also, curious about how you put together the power supply. I am not versed in that at all. cant really tell what the B+ voltages are. 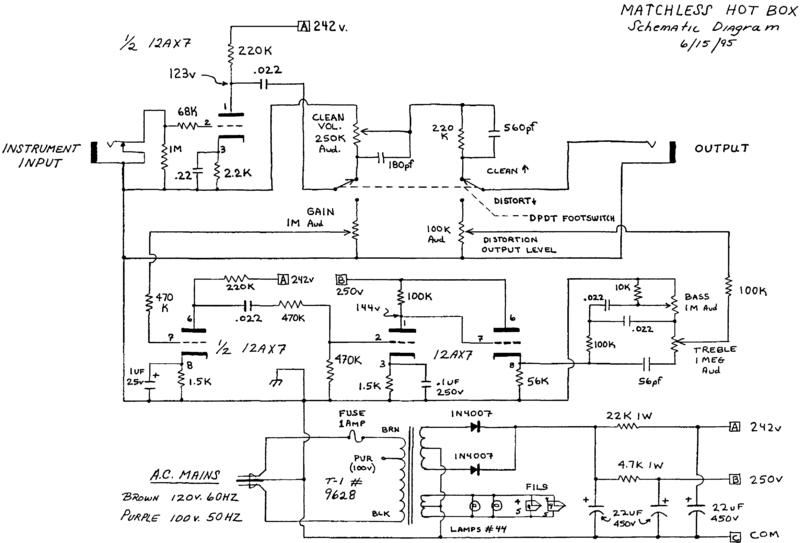 you can use the original Hotbox schematic for power supply and B+ voltage reference. I used one 230:12V and one 230V:9V transformer back to back to get high voltage and 12V to power the heaters. I have a very chimey handwired 15 w vox type amp. I’d love a hotbox. Is anyone cloning? I’d like to mod the amp and install the hotbox inside. what do you want to know? It’s a pretty standard power supply. Transformer, full wave rectifier and a couple of RC filters for both high voltage and heaters. I have searched and understood. But only one question, on this schematic, I can use both 6.3DC or 6.3AC for the heaters without any mod? Yes. Although, with AC, I’d use DC elevation to reduce noise, but it’s optional. I had corresponded with Matchless about a year and a half ago and they said they were going to re-issue hotboxes in February 2010. So far I have not seen anything. Do you know if there is a kit available for a Hotbox or if anyone is producing these? Using the Marshall Tonestack was brilliant. Can your “Tube Reactor Pre Amp” be plugged directly into a power amp? Or, does it work better in front of a standard guitar amp? Secondly, is it possible forego the channel-swithing and keep both ‘channels’ on at the same time? …like a multi-amp set-up or a “Voodoo Labs Sparkle Drive”? Yes, you can plug it straight into the power amp as it has high output voltage swing. I never tried to separate the outputs, but it should work. The first stage will be loaded more with both outputs plugged, but don’t know whether it will make it sound different or not. It’s worth trying if you need two outputs…in case it sounds different in a bad way, maybe a solid state buffer (IRF820 or something) at the end of clean channel would help.